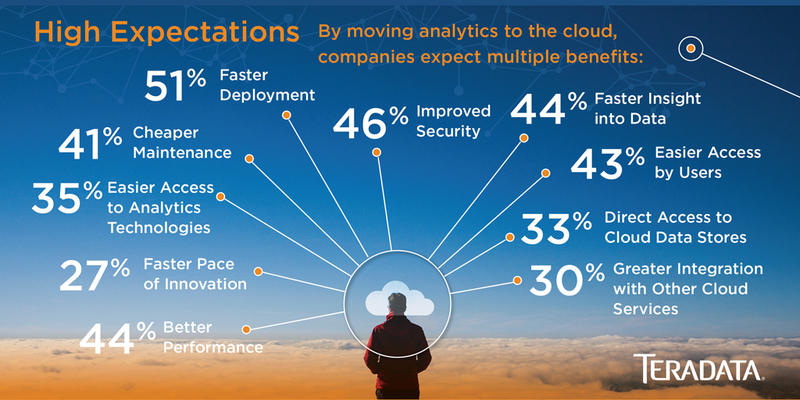 A majority of the largest companies in the world (83 percent) agree that the cloud is the best place to run analytics, according to a new survey by Vanson Bourne on behalf of Teradata (NYSE: TDC), the leading cloud-based data and analytics company. In the next five years, by the year 2023, most organizations want to run all of their analytics in the cloud. 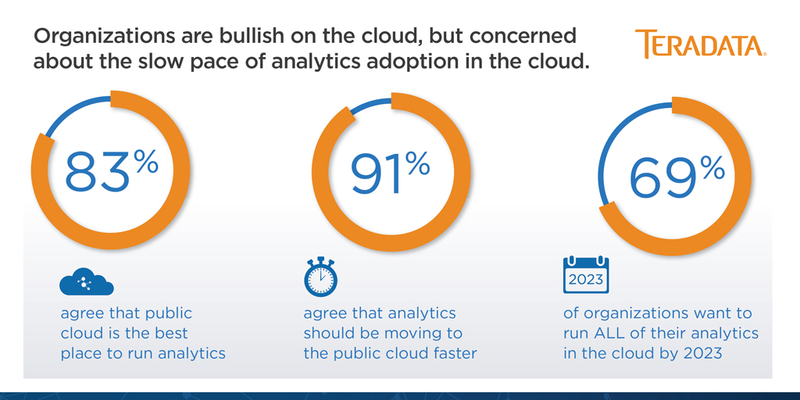 But, an overwhelming 91 percent say that analytics should be moving to the public cloud at a faster rate. Where’s the disconnect? 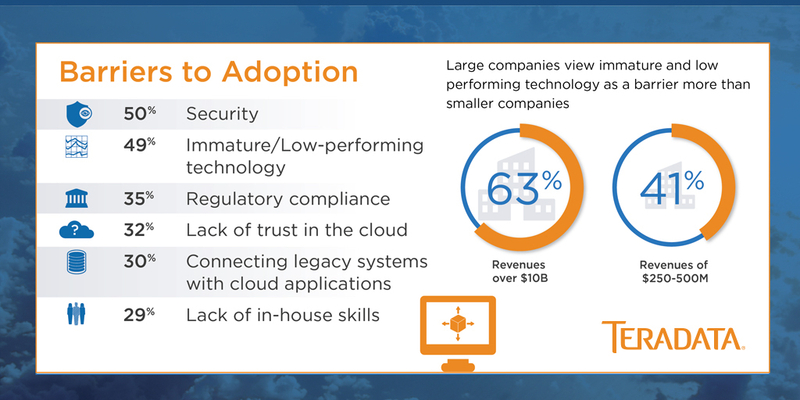 According to the survey, some of the biggest barriers to moving analytics to the cloud are security (50 percent), immature and low-performing available technology (49 percent), regulatory compliance (35 percent) and lack of trust (32 percent). Other concerns center on technology integration and talent: 30 percent are struggling to connect legacy systems with cloud applications, while 29 percent of respondents cited lack of in-house skill as a barrier. The survey, titled “The State of Analytics in the Cloud,” polled senior technology leaders at 700 large, global organizations, with average global annual revenue of $9.73 billion (19 percent with revenue ranging to $50 billion). The survey found that large organizations are maturing when it comes to their use of analytics, with one out of three using complex deep learning and machine learning to power artificial intelligence (AI). These companies are also experienced in using the cloud with one-third currently adopting public cloud across the whole organization. Unfortunately, the combination – moving to and using analytics in the cloud – is happening at a slower rate than other business applications and workloads. The respondents use BI, data discovery and data mining, and are moving quickly into advanced analytics such as AI powered by machine learning and deep learning, regardless of type of deployment. One out of three respondents are using complex deep learning and machine learning to power AI today. That number jumps to 68 percent of respondents when including the companies that plan to adopt AI technologies in the next 12 months. Nearly half are doing data visualization and data mining today, and that number increases to around three quarters of respondents when including the companies that will adopt these technologies in the next 12 months. When it comes to deployment, the organizations surveyed are bullish on the cloud, but concerned about the slow pace of analytics adoption in the cloud. They’re already moving to the cloud in other areas, with 35 percent currently adopting public cloud across the whole organization and 39 percent currently adopting public cloud in some areas of the organization. Organizations are enjoying their experience with public cloud and 92 percent feel they are somewhat or very successful with their use of the public cloud. 83 percent agree that public cloud is the best place to run analytics; only 16 percent disagree. 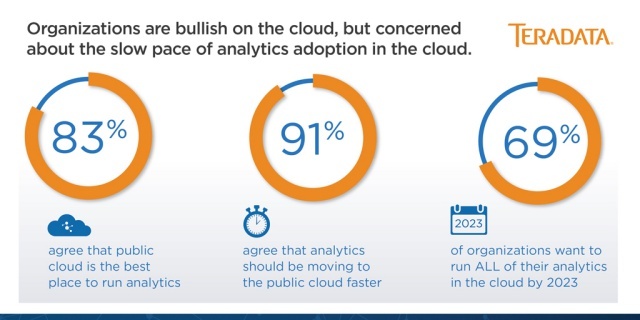 But 70 percent strongly agree or somewhat agree that analytics are moving to the cloud at a slower rate than other business applications and workloads, and 91 percent say that analytics should be moving to the public cloud faster. Security (50 percent), insufficient performance/too immature (49 percent), regulation (35 percent), lack of trust (32 percent), connecting legacy systems with cloud applications (30 percent), lack of in-house skills (29 percent), greater prioritization of other applications (24 percent), insufficient business priority (23 percent) and standardized SLAs that don’t fit our business (14 percent). 63 percent of companies with revenues over $10 billion view immature and low-performing available technology as a barrier, compared to 41 percent of companies with revenues of $250-500 million.